Kansas City opened up a 5-0 lead over Tulsa and stopped the Oilers’ comeback bid short in the final meeting of the season. 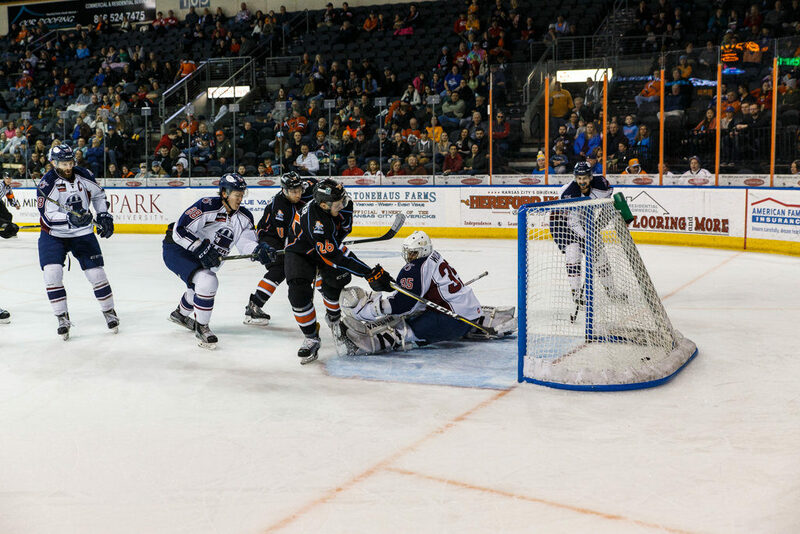 INDEPENDENCE, MO – The Kansas City Mavericks opened up a 5-0 lead to start the final week of the regular season in a 6-3 win over the Tulsa Oilers Monday at Silverstein Eye Centers Arena. Kansas City dominated the first period as the Mavericks jumped out to a 3-0 lead and outshot the Oilers 14-7. Matt Robertson scored the first two goals to get the Mavericks started. Kansas City looked to have made it 3-0, but had a goal waved off due to goaltender interference. Later in the frame, the Mavericks did make it 3-0, when Jared VanWormer scored on a 5-on-3 power play. Mark Cooper scored back-to-back goals in the second period to inflate the Mavericks lead to 5-0 by the 11:09 mark of the frame. Tulsa battled back to within three with two straight goals from rookie Roman Ammirato, who has four goals in the last three games. The Mavericks led 5-2 after 40 minutes. Devin Williams replaced Oilers starting goaltender Jake Hildebrand at the start of the second period and finished the game in net. Tulsa creeped closer, when a Charlie Sampair shot caromed off of Adam Pleskach and into the net to make it 5-3 with 11:53 left in regulation. Robertson completed his hat trick to halt the Oilers’ comeback bid and push Kansas City to the 6-3 win. The Oilers return home for the final three games of the regular season Wednesday, Friday and Saturday on the York Plumbing Ice at the BOK Center. Tulsa hosts Idaho Wednesday night at 7:05pm for $1 Beer Night, and welcomes Rapid City Friday and Saturday. Friday’s game is the “Outsiders Night”, with the Oilers wearing special jerseys which will be auctioned off following the game with proceeds benefiting The Outsiders House Museum project. Saturday is Fan Appreciation Night, with a pregame block party outside the BOK Center. Tickets are available for all three games by calling 918-632-7825 or visiting www.tulsaoilers.com.